Graves’ disease is an autoimmune disorder in which thyroid receptors are affected. Hyperthyroidism is the condition in which blood levels of thyroid hormones are too high. Graves’ disease is a disorder that is caused by an autoimmune reaction that occurs against TSH receptors that are in the thyroid gland. This causes overstimulation of the thyroid and overproduction of hormones. Symptoms include the development of infiltrative ophthalmopathy in which the eyes protrude, because of weakness in the eye muscles. A goiter is also likely to develop; this is a swelling that develops in the neck. In addition, skin problems known as infiltrative dermopathy can also be present. Other symptoms include rapid heart rate, anxiety, irritability, trembling, sweating, weight loss and being very sensitive to heat. Thyroid storm is a potentially dangerous complication in which the hyperthyroidism of the Graves’ disease worsens; this can result in organ failure if untreated. Cardiovascular problems can occur due to the excessive levels of thyroid hormones. Pretibial myxedema is a rare, although mainly cosmetic, a complication which results from the dermopathy which occurs in patients who have Graves’ disease. The condition can be diagnosed by a physical exam and blood tests noting levels of hormones. Doctors may note symptoms such as bulging eyes and the goiter. Blood tests may show lower than normal levels of thyroid stimulating hormone (TSH). Despite the low TSH these same patients often have higher than normal thyroid hormones in the blood. Tests in which radioactive iodine is administered and a scan of the thyroid is done can help diagnose Graves’ disease. Ultrasound and other imaging tests such as MRI may also be done. Graves’ disease is an autoimmune disease which is caused by the body producing antibodies against the receptors for TSH. 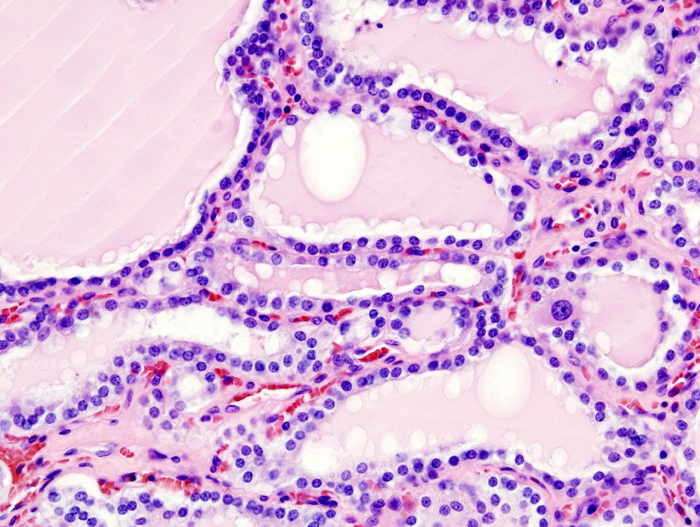 These receptors occur on the cells of the thyroid gland. This antibody has the unusual effect of stimulating the activity of the receptors with the result that excessive amounts of the hormones T3 and T4 are secreted into the blood. Certain genes may increase the risk of getting the disease, and these may interact with environmental factors. Evidence for this is the fact that Graves’ disease often occurs in families and in monozygotic twins. The CTLA-4 gene may be one of the genes that make people susceptible. Females are also at higher risk of Graves’ disease than males. The treatment of Graves’ disease can include radioactive therapy or even surgery to decrease the size of the thyroid gland. The idea is to try to decrease the overproduction of the thyroid hormones. Medication can be given to reduce the effects of the hormones. For instance, beta blockers can be used. Anti-thyroid medication such as methimazole is sometimes tried as a treatment. This is the preferred medication which has fewer adverse side effects compared with other choices. Hyperthyroidism is the condition in which levels of thyroid hormones in the blood are abnormally high for whatever reason. The symptoms are the result of excess thyroid hormones which has the result of increased metabolism. Symptoms include irritability, anxiety, increased heart rate, sensitivity to warmth, weight loss, and the development of goiter in the neck. Exophthalmos in which the eyes protrude may also be a symptom of hyperthyroidism. The condition can eventually lead to serious cardiovascular problems including atrial fibrillation and heart failure. Brittle bones can occur because calcium uptake into bones is impacted. Thyroid storm can occur which is a dangerous worsening of the hyperthyroidism which can cause organ failure. Hyperthyroidism can be diagnosed based on a combination of the results of thyroid function tests and a physical exam. Doctors can note symptoms and thyroid tests can be done. Levels of TSH and thyroid hormones in the blood can be noted. TSH may or may not be low depending on the cause of the condition. This is because TSH levels may actually be high if the cause of the hyperthyroidism is a pituitary tumor. Various imaging tests may be helpful in determining the cause of the diagnosis as well. There are many causes of hyperthyroidism including a pituitary adenoma (tumor) which causes excessive amounts of TSH to be produced. Other causes include Graves’ disease, cancer of the thyroid gland, thyroiditis or having a multinodular goiter or adenoma on the thyroid. Genetics are believed to play a role and if a person already has an autoimmune disease such as lupus or rheumatoid arthritis. Females also seem to have a higher risk than males. It is thought that it is likely to be a combination of genetics and environment that increases a person’s risk of the condition. The treatment of hyperthyroidism depends on what is causing the problem. Radioactive therapy may be helpful, and in some cases surgery. Anti-thyroid medications such as methimazole can be used. Difference between Graves’ Disease and Hyperthyroidism? Graves’ disease is the disorder in which antibodies made by the body attack receptors on the thyroid gland. Hyperthyroidism is the condition in which there are too many thyroid hormones in the blood. People who have Graves’ disease may have the eye condition known as infiltrative ophthalmopathy. People who have hyperthyroidism may have the eye condition known as exophthalmy. A symptom that may be present in Graves’ disease is dermopathy. 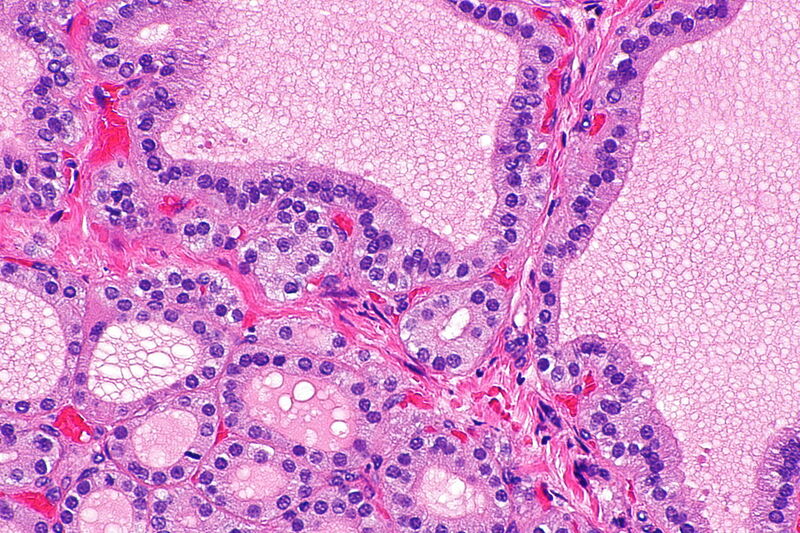 Dermopathy is not a symptom of hyperthyroidism. Graves’ disease is caused by autoimmune antibodies which attack TSH receptors on the thyroid. Hyperthyroidism can be caused by several conditions including cancer, thyroiditis, thyroid nodules, and immune disorders. The level of TSH in the blood in Graves’ disease is always low. The level of TSH is not always low in hyperthyroidism because in the case of pituitary tumors it can often be high. Complications of Graves’ disease include tibial myxedema, cardiovascular problems, and thyroid storm. Complications of hyperthyroidism include cardiovascular problems and thyroid storm. Graves’ disease and hyperthyroidism have many similar symptoms and both involve excess thyroid hormones in the blood. 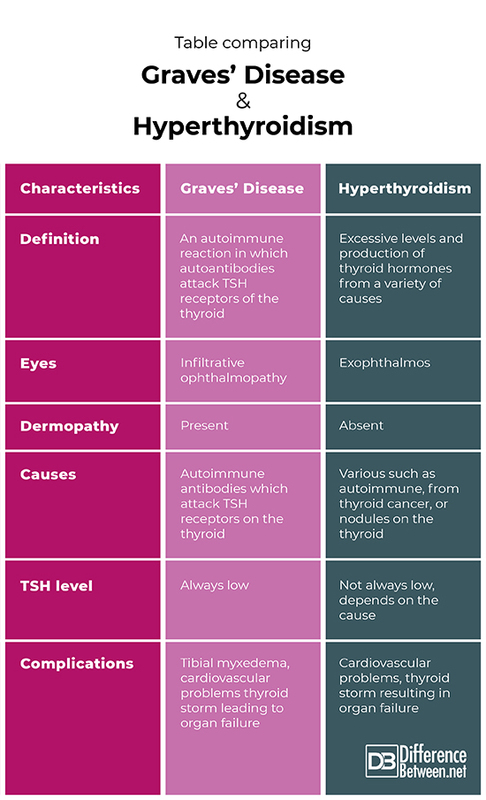 Graves’ disease is an autoimmune disorder which directly impacts the TSH receptors of the thyroid. Hyperthyroidism may be caused by many factors including cancer or an inflamed thyroid. Both Graves’ disease and hyperthyroidism can be treated using medications or by surgery or radiation therapy. Dr. Rae Osborn. "Difference Between Graves’ Disease and Hyperthyroidism." DifferenceBetween.net. January 17, 2019 < http://www.differencebetween.net/science/health/difference-between-graves-disease-and-hyperthyroidism/ >. Brix, Thomas H, Kirsten O Kyvik, Laszlo Hegedus. "What is the evidence of genetic factors in the etiology of Graves’ disease? A brief review." Thyroid 8.7 (1998): 627-634. Weetman, Anthony P. "Graves’' disease." New England Journal of Medicine 343.17 (2000): 1236-1248.